Dismantling Paradise is hard work. Accomplishing it by proxy, such as in writing a novel, also takes its toll. Perhaps thatâ€™s why Ken Kesey abandoned the novel form after completing Sometimes a Great Notion in 1964. He dismantled the myth of Eden at the end of the Oregon Trail. Americans claimed Oregon, in the words of John Quincy Adams, with the promise â€œto make the wilderness blossom as a rose, to establish laws, to increase, multiply and subdue the earth.â€ But the idea that the West is a storehouse of riches to be extracted from raw wilderness, is counterpoint to that other potent myth â€“ that the West is a natural, unspoiled Eden. Many folk long to spend their pilgrimage here in refreshing hot springs, even as money folk see the quick buck in resources, renewable or not. 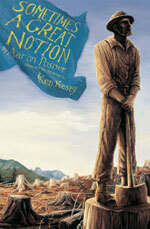 As Aaron Posnerâ€™s stage adaptation of Sometimes a Great Notion premieres at Portland Center Stage, and related lectures and discussions explore Keseyâ€™s importance and place in Oregon culture, letâ€™s recall how Kesey exposed that myth as baldly as a clearcut and covered a theme as old as Europeâ€™s invention of America. The empire with no clothes. An empire as precarious as the Stamper house cabled and sandbagged on the brink, the riverâ€™s edge. Sometimes a Great Notion is a compendium of Ken Keseyâ€™s passions and preoccupations, and one of them is delving into this split in our individual and collective will â€“ the will to conquer and destroy, and the will-less desire to sink into the land, to let Oregon weather and the wet landâ€™s fecundity that is like a low-grade fever run through us. William G. Robbins knows this story completely, and it formed the background for his comments on Kesey Sunday April 6, at an afternoon symposium with poet Elizabeth Woody and essayist David Oates at Portland Center stage, one of several similar events scheduled in connection with the play. The audience was small but very attentive to what the authors had to say about Kesey. In Landscapes of Promise: The Oregon Story, 1800-1940, and Landscapes of Conflict: The Oregon Story, 1940-2000, Robbins, a professor of history at Oregon State University, provides a comprehensive environmental history of Oregon, the story of the tug of war between those who would change the landscape and exploit its resources to accommodate settlement and economic growth and those who would preserve the natural character of the land. Robbins shows how thoroughly our resource policies are now captive to regional and national priorities and the â€œunbridled market imperativesâ€ of a global economy. Robbins noted that the historical period of the novel, after World War II until about 1960, was the last era of shoestring logging operations, the Stamper family an example of technology and effort now virtually lost, overtaken by the corporate operations on private and public lands. He made a special point of the â€œpropertylessnessâ€ at the heart of the novel, the fact that the Stampers donâ€™t own the land or the timber. In Landscapes of Conflict Robbins argues that the dominant features of postwar timber management practices — increased production from national forests, clear cutting, road construction, the use of pesticides, and implementation of a policy designed to convert â€œdecadentâ€ old growth to new stands with shorter harvesting cycles â€“- all can be traced to the influence of the marketplace, increasingly a global one, as the â€œprimary arbiterâ€ of timber policy. Warm Springs poet Elizabeth Woody said that every good book she knows has a river, and in Sometimes a Great Notion it is the Wakonda Auga, a made-up river at that. And that the characters are â€œsubsumed by the power of the river,â€ as in one way or another they become identified with this force that is greater than they are; characters driven by the power of nature â€“- in awe of it or defeated by it or inspired by it. Iâ€™m compressing Woodyâ€™s direct, pungent, evocative commentary here, in sharp contrast to her social observations about the novel, how it exposes individualism, the â€œgreat lieâ€ of the West, a white male lie at that, for Woody also pointed out where where the novel is weakest, in its portrayal of Native Americans, and its gloss of the role of women in the West, both pioneer and native, who sustained family and social relations in the wilderness civilization. Citing the writings of historian Richard White, Robbins also stressed how individuals come to know nature through work, “find an intimacyâ€ with the natural world that complicates the image Western man as all â€œwill to conquer,â€ an image fostered, by the way, in the Michael Brophy painting gracing Portland Center Stageâ€™s ads for the play, a carved wooden logger on his stump, surrounded by stumps as far as the eye can see. David Oates pushed that idea a little more by pointing out the elements in the novel demonstrating the dignity, beauty, productivity – even â€œtranscendenceâ€ that the Stampers find in hard work, collective enterprise. All part of what Oates sees as the â€œstubborn cockroach vitalityâ€ exhibited by the Stamper clan at the end of the novel. Where is Ken Kesey in this debate? Destroy? Love and produce? The intellectual or the rugged earth-bound individualist? The Stanford scholar, or the hippie-farmer wrestler? My guess he is ambivalent, in the novel as he probably was in life. His consciousness hummed on all cylinders.